Roughly 10 years after an iconic Resident Evil game Shinji Mikami brought us, for anyone who doesn’t know which one that is, it’s Resident Evil 4, he now returns and unleashes The Evil Within on us. The game that has to revive the survival horror genre. Perhaps in many ways the game has succeeded in doing such a thing. The game starts off with detective Sebastian Castellanos and his partner Joseph, who are driving to the police station of Krimson City. Other companions in the car are: junior detective Julie Kidman and officer Connelly who is driving the car. On their way over there they get a call to investigate a crime scene at Beacon Mental Hospital. When they arrive at the scene, everything looks abandoned. No one is standing outside, except for empty police cars from the officers who were supposed to be on scene and empty ambulances. 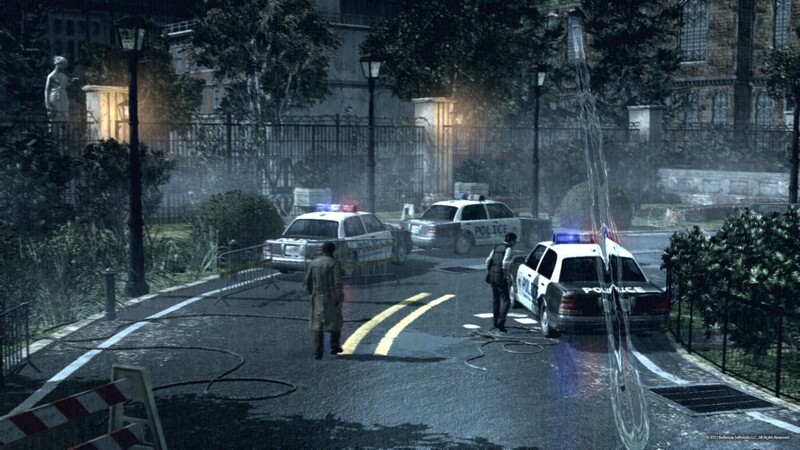 You carefully approach the hospital, ordering junior detective Kidman to keep an eye out outside while you and your partner enter the hospital. Once inside you see a room full of dead bodies and blood everywhere on the floor. Your partner finds a man still alive and calls you over. The man mumbles something about Ruvik and then loses consciousness. Joseph takes care of the man while you take a look at the security cameras. There you see three police officers shooting at a man, later to be revealed as Ruvik, but the man kills the police officers with incredible movement speed. Then he looks up at the camera and disappears, only to appear behind you a second later and knock you unconscious. When you wake up you are strapped upside down in a room full of blood between other corpses. You have to free yourself before it’s your turn. And from here on out you stumble from one nightmare into the other. 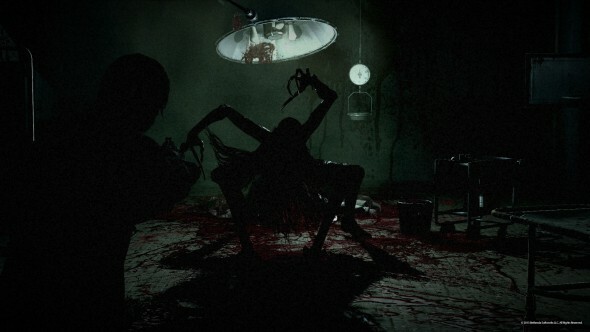 Because it appears the focus of the game is set on the horror side of the game, to scare the people, the story somewhat loses its importance during your progress in the game. Luckily eventually it picks up again so you can start making sense of what is happening to you. Level designs are wonderful, they created some strange but beautiful places in this game. With the help of superb lighting these places make you feel too scared to wander around in them for too long. This is probably the best thing about the graphics of this game, because what is a horror game without scary places to wander through. Character modeling is one of the strong points of this game, every person’s appearance is worked out very detailed. Too bad the characters don’t show much emotions. For example the protagonist never twists his face when something scary happens, he just throws dry remarks at you such as: “what is happening here?”. Music wise the soundtrack fits the dark levels perfectly and it actually makes them even scarier than they already were. You know when you are at a scary place and turning on music makes you feel less scary? Well, let’s just say, the soundtrack of the Evil Within will not aid you on your quest for finding peace and serenity. What makes your enemies even scarier than they already are, is the awesome sound effects. So it isn’t long before you create the reflex of hiding when you hear something. Voice acting is probably the one bad thing about the sound of this game. It feels like the voice actors had to do their job against their will. Their is no emotion whatsoever in the way they talk. Just like they have no emotion at all when you look at their faces. The Evil Within is a horror survival game with a lot of sneaking around. So you have to sneak past the enemies and try to stealth kill them as much as possible. This proves to be the easiest way to clear the areas so you can investigate them fully to find bullets, weapons, green gel, syringes and other items. You need all that to survive because you can only carry a limited amount of these things. Also, only a limited amount can be found, so you have to be careful how to use your bullets and health items. The longer you can hold on to them, the longer you’ll live. When progressing through the game you’ll also find other weapons besides the handgun. For example there is a shotgun and an Agony crossbow to be found. The shotgun is extremly effective in close ranged combat, while the Agony crossbow has a lot of different functions depending on which bolt you decide to shoot. There are lots of different bolts, some of them are the Explosive bolts, which have an explosive head that will detonate on impact or when enemies approach it if you shoot it in the ground or on a wall. There is also the Flash bolt which blinds opponents, blinded enemies can be killed with a stealth kill, saving you several bullets. The Harpoon bolt impales the enemy dealing a lot of damage. There are more bolts available but we don’t want to spoil everything for you. These bolts can be found throughout the game, but you can also make them yourself with parts you find along your way. Sometimes you can just find these parts, but most of the time you get them from dismantling all sorts of traps you run into. You can dismantle these traps for the parts or you can use it against an enemy. That’s a choice you’ll have to make whilst trying to survive. In most chapters you’ll eventually find a room with a mirror that shines. When interacting with this mirror, you’ll walk through it and you’ll be in some kind of hospital. In here there is a nurse which seems to know you quite well. The hospital serves as a save point and allows you the chance to upgrade your weapons and abilities. To upgrade them you will need to collect a lot of the green gel. Luckily, the game offers a fair amount of gel. There are also a lot of lockers in this hospital which require a key to open them. These keys can also be found scattered all over the levels. Upon opening these lockers, you’ll find extra ammunition or health items. Certainly items that prove to be very welcome during your ghastly trip. Sneaking around and killing the enemies, also referred to as the haunted, is something you get used to pretty quickly as the common enemies are not a big deal, that is when it’s not a horde that’s chasing you. The bosses on the other hand are something entirely different. You won’t be able to escape them like you can the haunted. One of the things you always need to do is to get rid of all the enemies in the boss area before triggering the boss fight. If that isn’t done these fights will be at least a hundred times harder, because you will have to deal with the boss and the haunted at the same time. Besides that rule you’ll have to find your own strategy to survive the boss fights. And then there is Ruvik, he is an entirely different story. If you see this guy, you know it’s time to run! While not being an immediate threat in the beginning of the game, Ruvik is the one person you really need to avoid. During your first encounters with him, the world will turn blue and the music will shift. Ruvik will approach you and the only thing to do is run from him, as your melee attacks and weapons are useless against Ruvik. Running up to Ruvik and trying to attack him will result in a one hit kill and you’ll have to reload the game. He will chase you and frequently teleport closer to your location. Don’t stop fleeing from him until the world returns back to normal and only then try to find a hiding spot. However if Ruvik notices where you hide, he will kill you and nothing can be done about it. So be sure to flee and hide without Ruvik noticing because it will greatly increase your chance of survival. At first it is very easy to flee from Ruvik, but as the game progresses it gets harder everytime you encounter him. It’s best to keep an eye out for this guy, because if you notice him too late it’s all over. This state of alert you need to have gives this game extra tension which is perfecty suited for this type of game. Keep in mind, the most important rule in this game is: if you get spotted and you think you might not make it, it’s better to run and hide than to try to take on the horde of enemies. You have been warned! 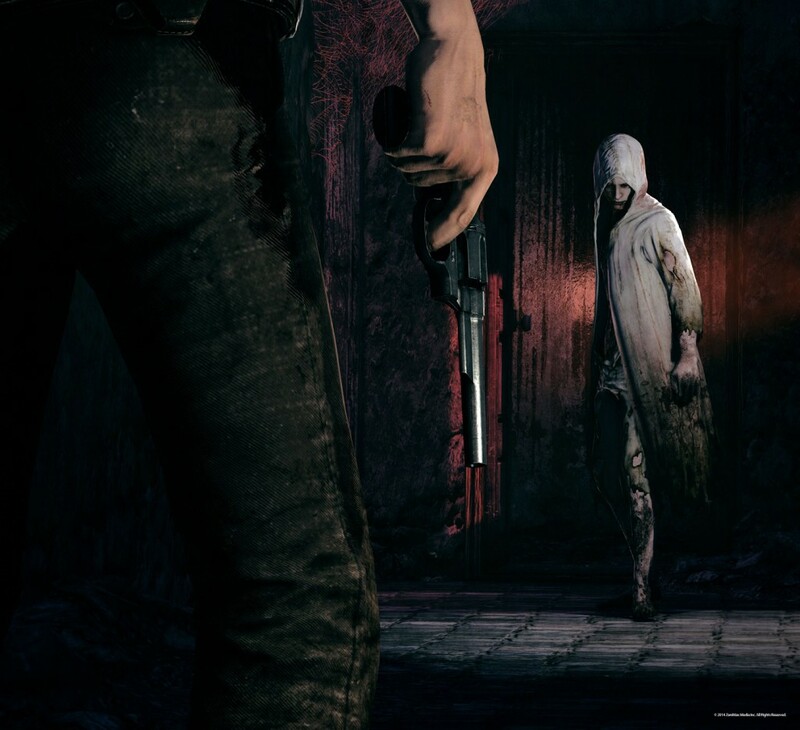 Although the game does not have an impressive storyline, The Evil Within is probably one of the best games in the survival horror genre. Stealth, rational thinking in an irrational situation and using whatever weapon you can form a great cocktail in this deadly bar. Wether you’re new the genre or you are a fan of it since long, be sure to try it out. It’s a game that will keep you at the edge of your seat, if not make you fall out from time to time.